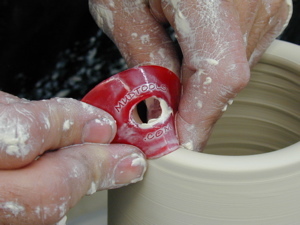 Mudtools by Michael Sherrill are shaped like the traditional kidney rib, they are the best, toughest and most consistent ribs available to potters today. Flexible ribs are available in 6 shapes and 4 degrees of hardness. Stainless steel ribs and scrapers are the finest cutlery grade. Shredders are ideal for shaping or reducing leather hard clay. Mudcutter wire tools and carving bows are also available.